West Side church claims designation will hinder its ability to restore and remain in Romanesque Revival structure. 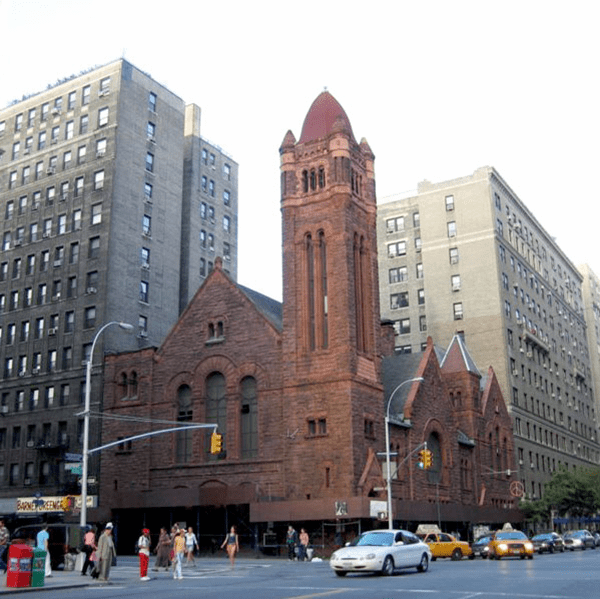 On July 14, 2009, Landmarks heard extensive testimony on the potential designation of West Park Presbyterian Church, at 165 West 86th Street in Manhattan. The red, sandstone- clad Romanesque Revival building was built in two phases. In 1883, the church commissioned Leopold Eidlitz, who also worked on the Tweed Courthouse and St. George’s Episcopal Chapel, to design a small chapel on the site. Six years later, Henry Kilburn expanded the church, incorporating the original brick chapel with a new sanctuary and bell tower, and cladding the entire structure in Longmeadow sandstone, the only church identified within the City to use this material. West Park congregation members and other representatives of the church spoke in opposition to designation. Kramer Levin attorney Valerie Campbell, representing West Park, testified that instead of helping to preserve the church, designation would hasten its decline. She stated that the building suffered severe structural deficiencies, including a damaged roof, forcing the congregation to worship at another site. Campbell argued that because of the high cost of repairs, the best method of preserving the building would be to partially redevelop the site. She said that West Park had partnered with a private developer to restore the main church building and construct a residential building on the footprint of the church house, but the development partner withdrew from the plan after Landmarks scheduled a designation hearing. Campbell said that designating the building could lead West Park to file a hardship application to partially develop the site and allow it to retain its home. Area residents, preservation groups, and elected officials expressed support for designation. Assembly Member Linda Rosenthal, who represents the West Side, called the church “one of Manhattan’s most historic and architecturally distinguished buildings.” Rosenthal acknowledged that the congregation lacked financial resources for the building’s upkeep, but said that any demolition on the site would be a tragedy. Landmarks Chair Robert B. Tierney adjourned the hearing without commissioner comments and did not set a date to vote on designation. LPC: West Park Presbyterian Church, 165 W. 86th St., Manhattan (LP-2338) (July 14, 2009).